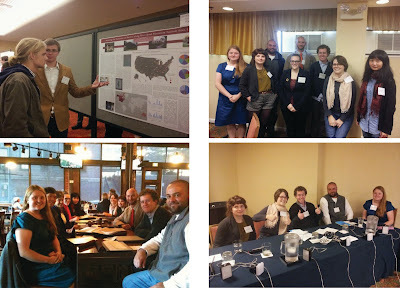 UT Geographers had a major presence at the recent annual meeting of the Southeastern Division of the Association of American Geographers (SEDAAG) in Asheville, North Carolina. The meeting, held Nov. 18-20, attracted almost 500 participants from across and outside of the southeastern United States. SEDAAG is one the largest and most active of the Regional Divisions of the AAG. In total, 8 faculty members and 12 students from UT Geography participated in the meeting. 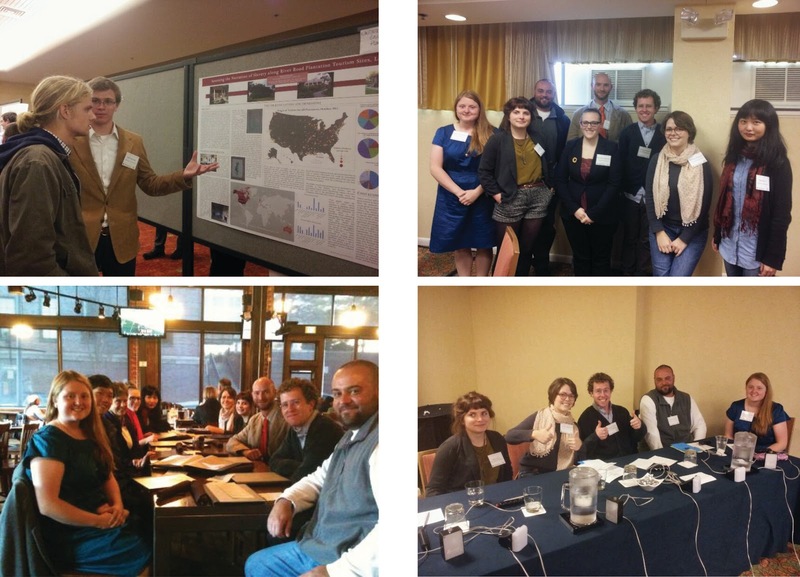 Two of our graduate students (Melanie Barron and Kassie Hauser) competed in the student honors paper competition and two undergraduate students (Erik Schmidt and Kaitlin Malick) competed in the student poster competition. All of our students delivered superb papers and posters and courageously (although unsuccessfully) battled for the World Geography Bowl Trophy. Also of note was a special panel session at the Asheville meeting organized in memory of former UT Department Head and Professor Sid Jumper. Dr. Carol Harden organized the session and Drs. Sally Horn and Bruce Ralston participated in this celebration of Dr. Jumper’s distinguished career. Special appreciation goes to Dr. Ron Kalafsky, who served as the Program Chair for this year's SEDAAG meeting. With the conclusion of the Asheville meeting, Drs. Josh Inwood and Micheline van Riemsdijk completed their two year terms as SEDAAG Secretary and State Representative (for TN) respectively. 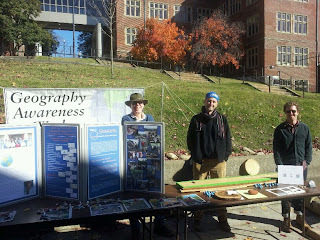 The Department of Geography also co-sponsored a student coffee hour at the SEDAAG meeting, allowing us to speak with a number of excellent students interested in being a Volunteer. One thing that clearly distinguishes UT Geography is the ability and willingness of our students and faculty to engage the Academy on multiple scales—from the regional to the national to the international. 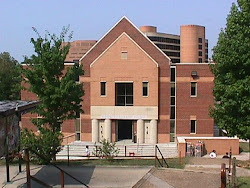 Next year’s SEDAAG meeting will be in Roanoke, Virginia and will be hosted by Virginia Tech University. We hope to see you there. --Derek H. Alderman, Department Head. Kassie Hauser presented her research findings at a symposium for McClure scholarship recipients in the International House. 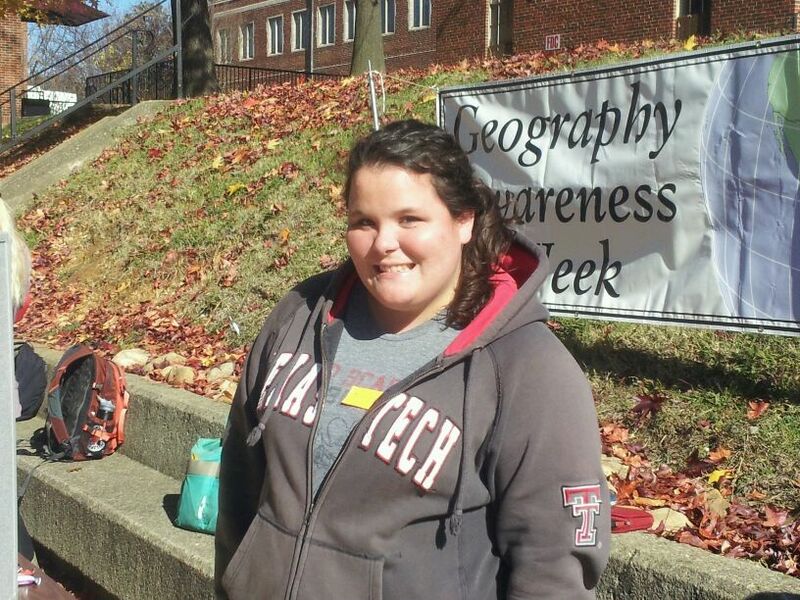 Kassie studied perceptions of climate change in Kakadu National Park in Australia in Summer 2012. From left to right: Micheline van Riemsdijk (academic advisor), David Ostermeier (project advisor, Department of Forestry), Kassie Hauser. 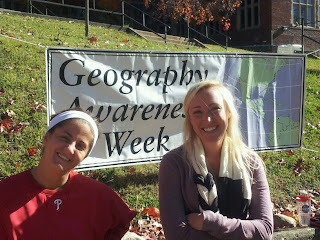 On November 13, 2012, UT Geography hosted a welcome and information table on campus in observance of National Geography Awareness Week. 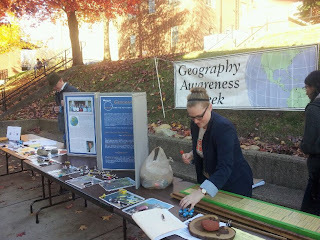 The table, located in front of Burchfiel, offered visitors information on jobs and careers in Geography, globe key chains, candy, and interactive science activities. Over 100 people stop by the table to talk, far exceeding our expectations. 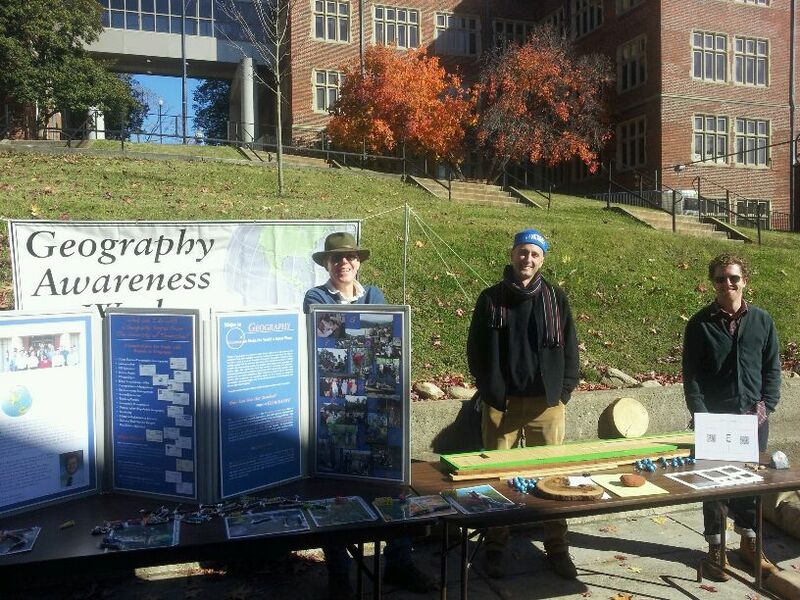 Half a dozen faculty members and 24 students (both undergraduate and graduate) staffed the table throughout the day. The event was funded in part by an Association of American Geographers EDGE grant, which funds professional development and recruitment activities in Geography. A thank you is extended to the many wonderful folks who helped make the table a success. In particular, I appreciate the efforts of Kurt Butefish (our Awareness Week coordinator), Will Fontanez (who designed the promotional display and marketing materials), and the other members of Awareness Week Committee (Drs. Kalafsky and Inwood, graduate students Kassie and Sarah, and undergraduate students Lauren and Dakota). Kassie Hauser successfully defended her thesis "Public Land in a Changing Climate. Who Decides? Who Governs?" Her committee consists of Drs. Harden, Tran, Ostermeier (Forestry), and van Riemsdijk (advisor).